It’s a great idea to convert YouTube to audio. By doing so, we can listen to music, audiobooks or other contents available on YouTube without Wi-Fi or mobile data. When it comes to converting YouTube video to audio, MP3 and AAC are the most popular output formats. AAC can offer high quality at relatively low bit rates due to fancy compression algorithm. In this article, you will be finding the two best methods to easily convert YouTube to AAC for free. iFunia Video Converter for Mac can convert videos from YouTube to AAC files with desired quality (such as 320kbps and 256kbps), efficiency and convenience. This Mac video converter has versatile features with powerful performances. You can use it to rip any video from YouTube, Vimeo, Dailymotion, Myspace, Facebook, Instagram and more than 1000 other websites and convert the downloaded videos to any video or audio format you need. It also supports downloading Full HD 1080p and Ultra HD 4K videos from websites that offer HD video content. 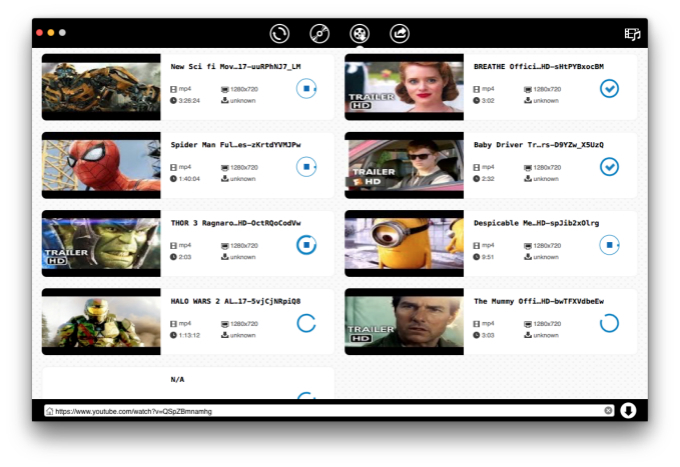 You can batch download and convert videos or audios using this software application. The step-by-step guide below will show you in detail how to convert video from YouTube to the format you need. Step 1. Install iFunia Video Converter for Mac on your computer. On the top of its user interface, you can find four icons which are, from left to right, the conversion icon, the DVD burning icon, the download icon and the share icon. Step 2. Copy the link URL of the YouTube video that you’d like to convert to AAC format. Go back to the software and click the download icon. And then you will find a URL box at the bottom. Paste the URL there. If you need to rip YouTube videos in bulk, just copy and paste multiple URLs. Click the download icon (indicated by an arrow), and the software will start ripping YouTube video(s) to your computer. This step is essential when you download YouTube to AAC or other needed formats. Step 3. As soon as the download is finished, you can find the downloaded videos on your computer. Click the conversion icon (e.g. the first icon on the top of the software). Drag and drop the downloaded video files to the interface. Click the button to open the output format window. Click the General Audio option and select AAC as the output format. Click the conversion icon, and the software will immediately start converting YouTube to AAC. You can also edit the output audio by clicking the Advanced Settings option. Other powerful features such as lossless file compression, DVD ripping, DVD burning, video editing, etc. If you are a PC user, you can use iFunia Video Converter’s Windows alternative Any Video Converter (a.k.a. AVC) which works in the similar way. Following the steps below, you can easily download video from YouTube to AAC file. Step 1. Download AVC and install it on your PC. Open the software and take a look at its user interface where all the features and functions are listed clearly. Step 2. There is an Add URL(s) button. Click it, and you will find a green add icon. Click the icon to open a URL box. Paste a YouTube video URL there and you can rip video from YouTube. Wait for the download to finish. Step 3. There is a drop-down menu besides the Convert Now button. Click it and scroll down. Find the desired format (AAC in this case) and select it. The final thing is to click the Convert Now button. Another way to convert video from YouTube to AAC is to use online services. In this case, you don’t need to install any software. While online tools can’t provide high quality conversion or fast speed nor do they allow batch conversions, they are convenient to use. This is another YouTube to AAC online converter that you can use. The site allows users to download and convert videos from YouTube and several other video sharing websites in video and audio formats such as MP3 and AAC. The tool provides a feature that allows you to search YouTube videos on its homepage so that you don’t have to visit YouTube. 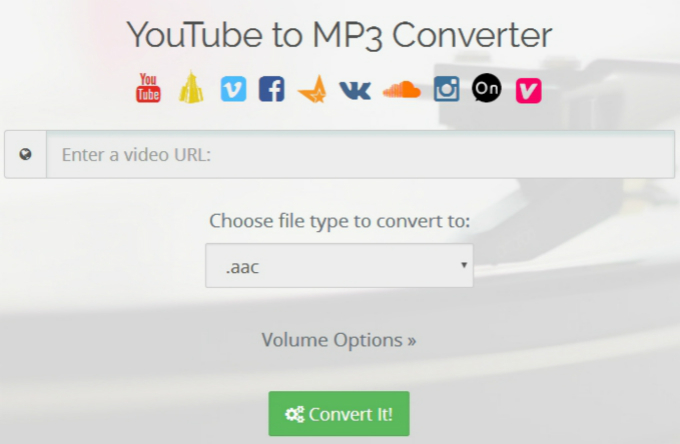 This online media conversion tool can download and convert any video from YouTube to AAC, MP3 and M4A. It can also download online videos to MP4, 3GP, AVI, MOV and MKV. The site supports YouTube, Vimeo, Dailymotion and a few other sites. This YouTube to AAC online converter is dedicated to convert online video content to audio. 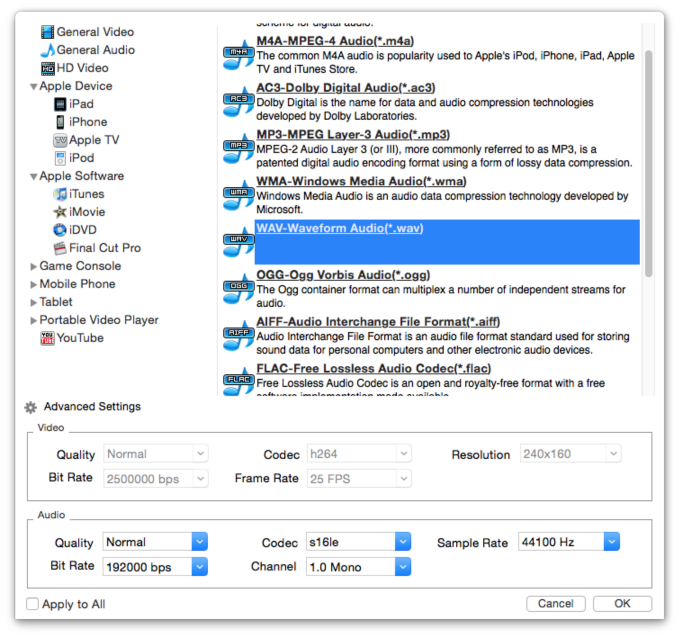 It supports output formats including AAC, MP3 and M4A. Users only need to copy and paste video link URL and select output format. The methods, software and online tools recommended above can be useful if you need to download YouTube to AAC or other needed audio as well as video formats. Apart from converting YouTube videos to AAC, there are also detailed guides on how to download YouTube to OGG, WAV, etc. Hopefully they can be of some help. What do you think of the article? Welcome to share your thoughts and opinions.